What's the Edmonton Oilers Magic Number for Leon Draisaitl Extension? 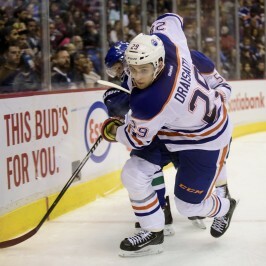 What’s the Oilers Magic Number for Draisaitl? One of the few positive stories for the Edmonton Oilers in 2015-16 was the breakout year center Leon Draisaitl had. Draisaitl, 20, put up 51 points in 72 games for the Oilers and this season his contractual status will once again make him one of the underlying storylines for them. Edmonton burned through his entry-level contract (ELC) by wasting away his 2014-15 season when he played a limited role in 37 NHL games and scoring just nine points. He wasn’t ready for NHL duty and was used in a limited role averaging just 12:40 TOI. Both former head coach Dallas Eakins and general manager Craig MacTavish held a lot of the blame and it’ll be now-GM Peter Chiarelli’s job to make due with the situation. The salary cap hell that happened when he was with the Boston Bruins was one of the contributing factors that led to his dismissal. Chiarelli will be keen not to make the same mistake in Edmonton. The Oscar Klefbom extension last season was the first big restricted free agent re-signing that Chiarelli had to do in Edmonton and he got arguably the team’s best defender done for $29.1 million over seven years. It has the potential to be one of the best value contracts in the league if Klefbom develops as hoped into a bonafide top pairing defenseman. Sure Chiarelli got mixed reviews with the Milan Lucic UFA signing ($42 million/seven years), but that was the market price. Related: Should Oilers Extend Draisaitl This Summer Instead Of Next? Draisaitl is the next big RFA for Edmonton and Chiarelli has to get a number that is fair and equitable for both sides. There’s a looming cap logjam coming up for the Oilers with Connor McDavid, Brandon Davidson, Darnell Nurse and potentially Nail Yakupov (if he doesn’t get traded) compounding the payroll as it stands today. A big part of Edmonton’s negotiating power is off of that horrendous rookie year. From management’s perspective they can argue that the player, all things considered, is an unproven commodity in the NHL. This makes Draisaitl different than the likes of Aleksander Barkov, Nathan MacKinnon and Derek Stepan who all recently re-signed big money long-term contracts around $6 million per year with their respective teams. Looking at the table below of comparables and their production over the last two seasons, the cap range falls between $2.8 and $6.5 million. Boone Jenner and Alex Galchenyuk are included with their bridge deals but the true scale is between $4.0 and $6.5 million. The points-per-game (PTS/GP) range from 0.52 and 0.77 with NY Rangers center Derek Stepan at the top of both categories. Draisaitl falls onto the lower end of the scale (0.55 PTS/GP). Florida recently re-signed a trio of forwards as Nick Bjugstad ($24.6 million AAV, 7 years), Vincent Trocheck ($28.5 million, six years) and Barkov ($35.4 million, six years) all re-signed big extensions. A similar 51 points in 72 games and Draisaitl suddenly jumps to the high end of the scale (0.70 PTS/GP) and can challenge the likes of Stepan, Barkov, MacKinnon and even teammate Ryan Nugent-Hopkins in salary. There is a lot that is unknown in what’s going to happen with Draisaitl in Edmonton. It’s unknown how the logjam at center will play out with everyone entering the year healthy. It’s possible he ends up on the wing with either McDavid or RNH. Head coach Todd McLellan has a love affair with RNH, when healthy, and sees him as the Oilers version of Joe Pavelski. That could mean that worst case scenario Draisaitl might get bumped to the number three center role. Draisaitl also won’t have Taylor Hall to play with this year, the two had tremendous chemistry together and were a reason Draisaitl exploded out of the gate in Edmonton last year. The best bet for the Oilers is to get this done early and not risk having a PK Subban-like situation unfold in Montreal where he vastly improved his stock and is now one of the highest-paid players in the NHL. Draisaitl likely won’t have that sort of impact but the argument over $1-million in salary could be the difference in negotiations with a star player that could end up really costing a team. If the Oilers were to turn it around in the next year or two and start contending for a playoff spot they’ll need cap space to bring in some missing pieces. Edmonton has sort of shot themselves in the foot with the $6 million AAV benchmark guys like Hall, RNH and Jordan Eberle got immediately after their ELC’s were to finish. Under Chiarelli they’ll really have to label that as mistakes of the old regime and get a solid number for guys like Draisaitl. This is going to be an interesting set of negotiations, there are several marquee RFA’s that will be up for extensions this summer with centers Ryan Johansen (Nashville), Tyler Johnson (Tampa Bay), Evgeny Kuznetsov (Washington), Alex Galchenyuk (Montreal), Mika Zibanejad (NY Rangers) and Mikael Granlund (Minnesota) leading the way. These negotiations will play a key factor in Draisaitl’s extension and if I was his agent, I’d wait until another team set the price and drag this into the half-way point of the year at a minimal. They’ll have the World Cup of Hockey to build on, a 41-game sample size to improve his value from his horrendous rookie year and really try to challenge his teammate RNH in dollars. 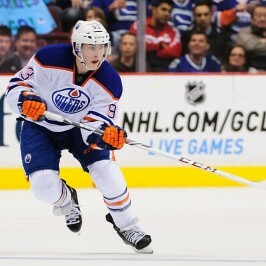 If Draisaitl outperforms RNH you could see him strike rich with a $6 million dollar deal or close to. If he holds steady they could get Draisaitl in the low $5 million range on a long-term deal. End of the day the Oilers hold the negotiation power right now but as the season goes on that number could seriously creep up and cost the Oilers dearly in the long run.